Home Science for Kids 5 Ws & H Why’s it hard for Ketchup to flow? Why's it hard for Ketchup to flow? Why’s it hard for Ketchup to flow? 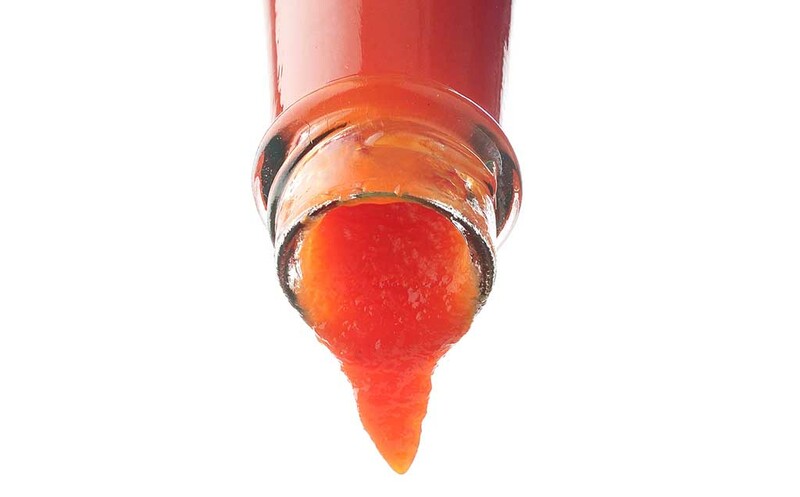 Why is it so tough to get ketchup out of the bottle? When you overturn a sauce bottle that has been left untouched for some time, chances are, either the sauce will not come out at all or a gigantic blob will plop down on your plate. Getting ketchup to ‘flow’ out of the bottle can be quite an ordeal. However, if you shake the bottle before overturning it, the thick gooey ketchup will flow out more freely. This strange property of changing from a gel like thickness (half liquid-half solid, like your toothpaste) to a free flowing liquid and back again is called thixotropy (pronounced thick-saw-tro-pea). The word has been derived from the Greek thixis, which means “the act of handling” and trope, meaning “change”. So a ketchup is a semi-liquid substance which changes on being handled. This happens because of the shape of the ketchup molecules. They are in the form of long chains. When the ketchup bottle is left untouched for some time, the molecule chains coil up together in a jumble. When the bottle is shaken, the molecules break apart and become loose. Hence, the ketchup starts flowing. You can even make your own thixotropic substance! For that, you need one cup of cold water and one and a half cups of cornstarch. Pour the water into a shallow dish. Add the cornstarch to the water slowly, one teaspoon of at a time, stirring all the while. Continue till you have exhausted all the cornstarch. Strike the surface of the water-cornstarch mixture with the back of a spoon. The mixture will not splatter like any other liquid. This is true for any thixotropic mixture. If you drop a small hard object, such as a tennis ball, on its surface, the mixture becomes firm and does not splash. This is because cornstarch and water molecules have fairly fixed positions. They cannot move freely under pressure and behave more like a solid. However, if there is no pressure, the mixture behaves like a liquid. Quicksand is also a thixotropic mixture, the more the pressure you apply the harder it gets to free yourself. The best way of getting out of quicksand is to apply force very slowly. Next articleWhy is the Dead Sea dead?